By Niti Majethia for KidSpirit's Beauty and the Senses issue. I was born and raised in Mumbai, India, a country full of different traditions and values. India has a caste system with different classes in Hindu society: Gujratis, Kutchis, South Indians, Punjabis, and many more. Since each caste believes in a different god, India is adorned with many different beautiful temples. Each caste has its own set of rituals, beliefs, cuisines, colors, festivals — and there is so much variety. Variety like the colors in the sky; each color holds something fresh. Today the caste hierarchy in India is disappearing, especially when it comes to celebrating festivals together and sharing cultures. That is what often astounds me. Each city has its own culture, its own cuisine, its own style. Everything is so different, yet every part of India shines with its own light. In every part of the country, people are not afraid to be proud of their culture. Living in Mumbai I have friends from all different cultures, all coming together and celebrating festivals. 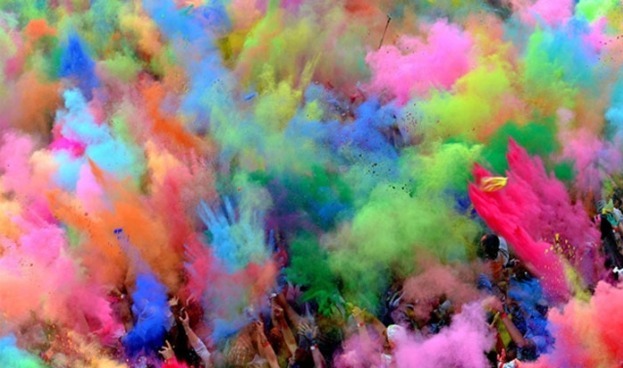 One such festival is Holi, the festival of colors, the colors representing the arrival of spring. People of different religions come together and put color on each other. The color is usually a powder or paste, and it is smeared on the face and hair. Imagine many people doing this to each other! The powder is blown into the air and the whole atmosphere of the city smiles like a rainbow. An old Indian story, which is also said to be one of the stories behind Holi, is of Prahlad and Holika. Holika was the sister of a demon king of the Asuras. But Prahlad, the demon king’s son, was a devotee of Lord Vishnu. The demon king became angry as he wanted his son to worship him. He challenged his son to sit in a burning pyre, on his aunt Holika’s lap, who was said to be wicked and have a power that would protect her from the fire’s harm. Prahlad prayed to Lord Vishnu to keep him safe and when the time came, Holika was burned to ashes, but Prahlad remained unharmed. Some say that Holika begged for forgiveness before her death and Prahlad told her that they would remember her every year on the day of Holi. Ganesh Chathurthi, my favorite festival, is about bringing an idol of Lord Ganesha home and decorating it. Relatives, friends, and visitors come together at home to receive his blessings. This is done as we offer prasad, which are sweets, to Lord Ganesha. After this ritual, we offer these sweets to all our guests and this is how we then receive his blessings. What I like is the strength in our belief; we believe in god with all our hearts. As much as I wish I could take home his idol and decorate it, I never have to worry, because the whole city has millions of idols and decorations. During the festival just walking down the road is like being in a parade! Gods and goddesses hold strong meaning in India, and there is depth to every festival as each is based on a real-life story. Within the history of India, and Indian mythology, there are various real-life stories and specific events that have taken place when a god came to the earth as a human. One of the most inspiring festivals is Janmashtami, in honor of Lord Krishna. Men climb onto each other’s shoulders to make a human pyramid, and break a dahi handi, which is a pot of curd. This is a mud pot that is hung very, very high! Men create a human pyramid to break this pot and once they finally do, there is an uproar of clapping and excitement from the crowds. This event happens almost everywhere, all over the city. It is meaningful because, as a village child, Lord Krishna was very fond of curd and one day broke the pot. Janmashtami is a celebration of his life and is inspiring because it reminds us, when we are deep into our prayers, of our faith and love. These festivals mean a great deal to me because there is so much worth celebrating in my culture: how strongly we believe in the light of our religion and how grateful we are to god. Each celebration has its own intricacies and differences, whether it be in clothing, food, music, or rituals. And all these differences, in culture, religion, people, make life so much more stimulating. Each culture is like a star. If we connect these stars, what do we find? A constellation that guides us home. When Niti wrote this article, she was 15 years old. Niti lives in Mumbai, India, and has been writing poems since she was six. Her poems have been published many times in Robinage (a children’s newspaper in India) and in magazines in the United States, and have won a short story competition in Mumbai.